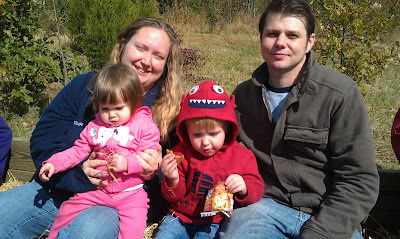 A while back I had written a guest post about our CSA for my friend Bekah's blog. Since we had our last CSA pickup this past weekend and because I've been posting recipes using what we've been getting all summer and fall, I thought I would tell you all a little about it. This summer we, along with another family, joined a CSA. It's something I have wanted to do for awhile now and I'm so excited we got to finally do it this year. I remember looking several up when we lived in Pennsylvania but we never joined. A CSA, or Community Shared Agriculture, is a farm dividing up all its produce among a group of shareholders who share with the farmer the risks and benefits of farming. Each week we get a share of the fruits and vegetables grown at the farm. We've received all sorts of goodies, some of my favorites are broccoli, spinach, strawberries, Sungold tomatoes, tomatoes, green peppers, zucchini, kohlrabi, green beans and blackberries. We've received many more veggies than this too. Our CSA started in mid-May and lasted almost six months! I absolutely love it. Having fresh veggies every week that are locally grown AND Certified Naturally Grown is so awesome. We have more than made up for the cost of our share. Another thing I love about it is that my son gets to experience first hand where his food comes from, something that I think is definitely lacking in this country - and he loves it! Once my daughter is old enough, she will come along too. Another thing I love about it is that it is very family oriented. They have several events throughout the season, such as the garden party, sweet potato dig and shareholder picnic that provide activities to do as a family. While my kids were too young to do anything but the games at the shareholder picnic, they will be able to help in a few years and I cannot wait. Going to the farm every other week to pick up our share has also provided such a sense of community with the other shareholders. We may live all over the city, but it's such a great feeling to go out there and know that it's just people helping people. Again, something I think is lacking in our world. Localharvest.org is a great website to find local CSA's. They're expensive, but if you're able to afford it or can split the cost with another family, I highly recommend joining a CSA near you. I love them. There are so many great books out there, it's so hard to choose! usborne books are really nice! I'm not sure we're doing our CSA next year. :( we sort of decided it wasn't worth the cost this year. We're doing it again next year. I love it. It makes us eat vegetables, way more than we ever have. Ours works out to about $14/week for veggies, which is way cheaper than we would pay for the same stuff in the store! I've never heard of Usborne Books. I will have to check them out! Usborne offers so many books, I had no idea! We got E a Christmas sticker book at the craft show at the old courthouse last year. Usborne has such great stuff! They are! I really want to get E some of the dry erase books. I love that everything is educational but also fun for the kiddos. I love these books. I got some for my grandkids last year. They are really well made and high quality. Plus they have so many choices. I love that there is something for everyone. I can't wait to buy a few more for my kids! This is my first time hearing about these books! Thanks for posting! They're really great. I'm so glad I found them myself! I really really like them. Good luck! I had no idea that they had so many books! That was exactly my experience! There are so many choices it's hard to decide, but my boys would love the See Inside Trains! I'm book marking your site for sure! My 7 year old loves books...especially educational ones. I have never heard of them either. He would like the Things To Spot In The Ocean one. He loves sea creatures =) They have a lot to pick from!